Asphalt shingles are one of the most common types to renovate the roof. Most of these tiles are made with a layer of fiberglass mat coated with mineral granules and asphalt. This is an all-purpose type of tile and practical for most homes. They are long-lasting and can even come with a warranty that lasts for 30 years or more. They are easy to install and easily sourced should a few need replacing in the future. The rolled roofing is a practical and cost-effective choice for the outbuilding or similar structures. Also, it can be used on the low-slope roofs on residential homes. 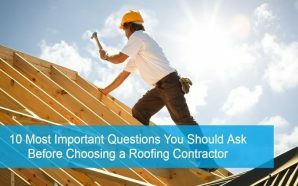 This is one of the quickest methods to give long-term roofing, but isn’t the most attractive to look at. Rolled roofing comes in rolls of nearly 100 sq ft and is very effective at stopping the rain from getting through. Metal roofing is no longer limited to warehouses. Even on large mansions this type of roofing can look incredibly stylish. It isn’t attractive to any of the wood-boring insects that attack the home, such as carpenter ants or termites and is a fire-resistant material. 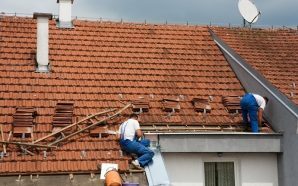 It can be quite expensive and isn’t the easiest roofing material to install. But, it is seen as an eco-friendly option to use on the roof. In most houses, steel is used as the roofing material. The beauty of steel is that it is sturdier and heavier than aluminum. According to manufacturers, multiple coatings as well as finishes can be applied in order to protect steel from regular rust and corrosion. Usually, steel is zinc-coated for protection against corrosion. One coat of epoxy primer is good to fight adhesion. Aside from this, a baked-on top coating of acrylic offers protection and color. Since the sheet systems are ideal for commercial uses, they are given paint finishes that stand the test of time. 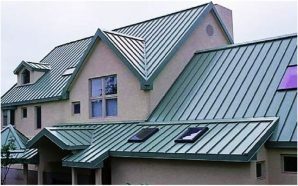 Aluminum, which is very lightweight, is commonly used for making home metal roofs. The reason is that rust can’t “eat” aluminum. Here it is important to note that the coatings are the same that can be used on steel. Another characteristic of aluminum is that it is soft and is not as strong as steel. 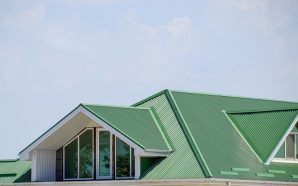 According to environmentalists, using aluminum for roofing purposes is not a wise decision as it is a precious resource.